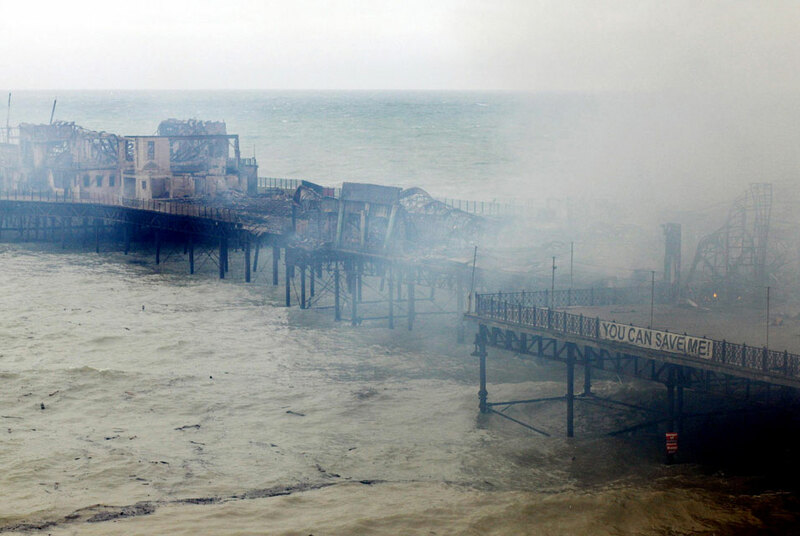 At around one o’clock this morning, a fire broke out on the historic Victorian pier at Hastings in Sussex, England. Over 50 firefighters and 2 lifeboat crews tried to contain the blaze, but by the time the flames were put out 7 hours later, 95% of the superstructure had been destroyed. Thankfully nobody was injured. Two young men aged 18 and 19 have been arrested on suspicion of arson. The Hastings Pier was built in 1872 by premier pier designer Eugenius Birch. It was known as the “peerless pier.” The original structure was a 910 feet long wooden boardwalk built on a lattice girder framework supported by 14 cast iron piers. It was the first seaside pleasure pier to have a large pavilion built on it. The original pavilion seated 2,000 people but it too was destroyed by fire in 1917. It was rebuilt even bigger in 1922 and would be renovated again along with several adjacent buildings in Art Deco style in the 1930s. Although the pier would begin to decline in popularity after World War II, the pavilion saw a brief revival in the 60s as a concert venue for famous musicians like The Rolling Stones and Jimi Hendrix. It also hosted the Bayeux Tapestry during celebrations of the 900th anniversary of the Battle of Hastings in 1966. The buildings and structure weren’t maintained well and storm damage to some of the structural columns raised concerns about the pier’s safety. It was closed to the public between 1999 and 2002, then opened again briefly under new ownership and closed again in 2006. A local historical preservation society, Hastings Pier & White Rock Trust, just this year succeeded in persuading the Hastings council to buy the pier from its current owners using compulsory purchase powers (the British version of eminent domain) as long as funding could be found, and were inviting architects to submit restoration designs. Despite the devastation of the fire, since 7 of Birch’s original cast iron piers and the lattice framework are still standing, albeit in a weakened state, there is still hope that Hastings Pier might pull through. Wills said the £50m rebuilding of the Grand pier at Weston-super-Mare, following a similar fire in 2008, provided hope to campaigners in Hastings. Andy Brown, south-east regional director of English Heritage, agreed that a new pier could rise from the ashes: “There’s a long history of piers catching fire and buildings being replaced. Sadly this is normal. Let’s hope it’s a mild autumn and winter, then. Here is some heartbreaking footage of the pier engulfed in flames shot by YouTube user bekka13xx who lives across from it. 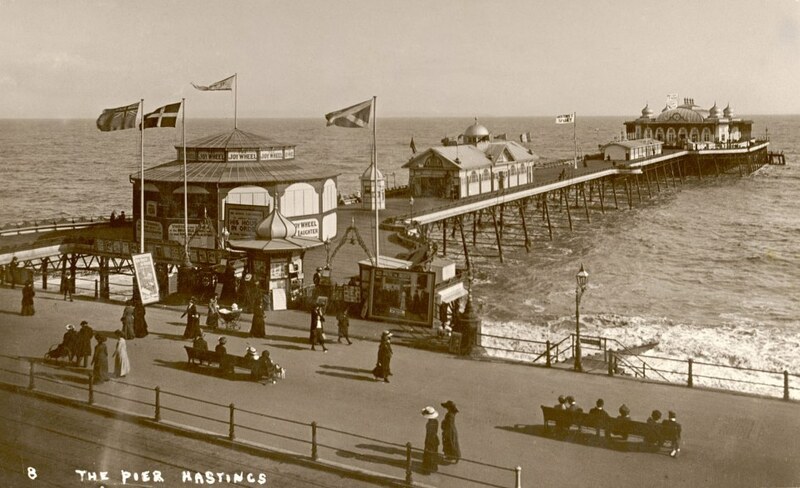 To learn more about the history of Hastings Pier, see this Hastings Chronicle essay. This entry was posted on Tuesday, October 5th, 2010 at 11:12 PM	and is filed under Modern(ish). You can follow any responses to this entry through the RSS 2.0 feed. You can skip to the end and leave a response. Pinging is currently not allowed. What a shame. What the hell is wrong with people? Twenty bucks says heavy imbibing was involved. What an absolute tragedy… how could it be rebuilt, even if the original cast iron piers and the lattice framework are largely intact? From the pictures it looks like the superstructure would have to be entirely rebuilt, maybe with some salvaged pieces.